In the aftermath of the devastation, it was believed that nothing would grow in Hiroshima for 75 years.' Yet, weeds began to grow again out of the scorched earth. Although much had been wiped out, seeds below ground escaped fire, blast and radiation damage. In particular, the blooming of the city flower, Canna Oleander, became a symbol of hope. Cheaply constructed makeshift dwellings,‘barakku' (barracks) began to be built in the wasteland. By December 1945, the number of shacks increased, but the living conditions were appalling, with many people on the verge of starvation. By April 1947, more permanent wooden houses sprung illegally. Three months after the bombing, a Reconstruction Committee was organized under the direction of the central government’s National Central Planning Office for Reconstruction. In January 1946, the Hiroshima Reconstruction Bureau was set up by Hiroshima City to carry out reconstruction measures. Municipal authorities, the city assembly and Hiroshima’s citizens cooperated to prepare a modern city plan. 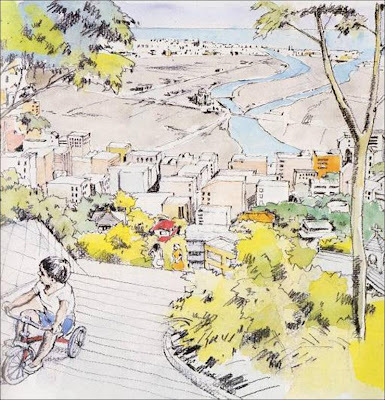 A Reconstruction Council discussed the reconstruction process and the future of Hiroshima City. Proposals were meticulously debated, explained and justified until a general consensus on the actual approach and guidelines to the reconstruction of Hiroshima was decided. 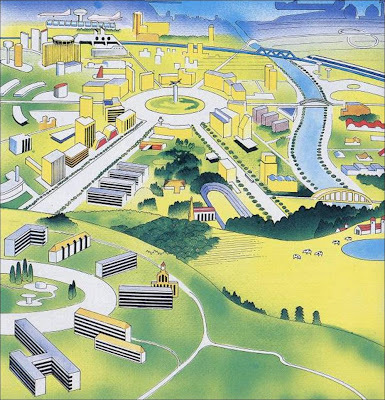 These combined visions of Hiroshima’s future were the basis for which the new Hiroshima would emerge and develop. The idea of reconstructing a new city above a mass graveyard disturbed many. 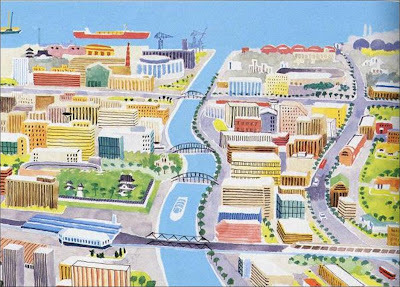 This proposal suggested the new city on another location while the city centre remained a grand symbol of world peace surrounded by religious and cultural institutions. Another proposal reflected the desire to forgive and forget the total destruction and loss of entire families and relatives. 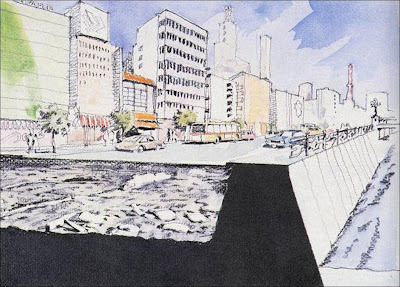 This proposal, by Shigeru Watanabe, a renowned artist, was of a modern, advanced development, without any indication of the devastation. Sankichi Toge envisioned a formal concentric design with new buildings encircling a Peace Memorial. This proposal suggested the new city to be constructed on top of the old, raised by large concrete pillars and foundation. A new slate of development could be achieved while keeping the old city preserved and remembered. 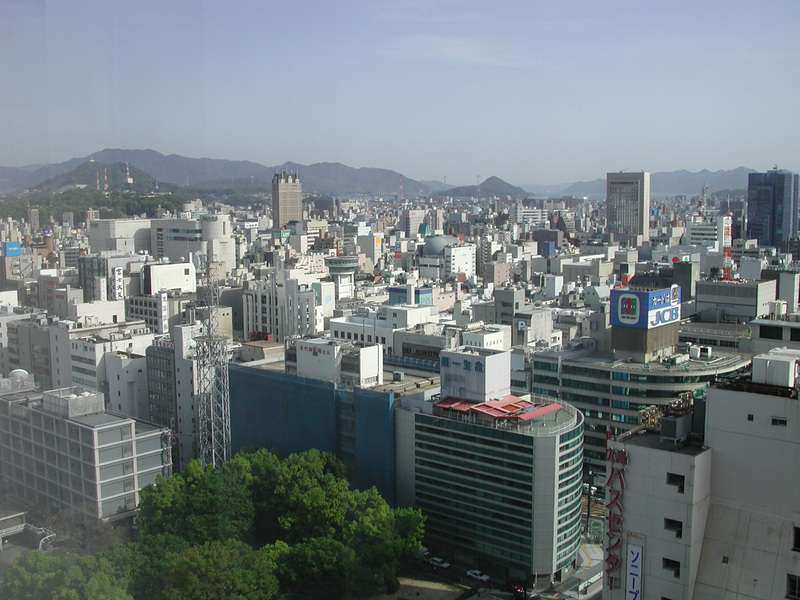 Today, Hiroshima’s city centre has been totally rebuilt, dominated by commercial high-rise blocks; a testament to the indomitable human spirit. But the Atomic Bomb Dome, Peace Park and other memorials still commemorate the city’s dark history. The memory of 6th August 1945 endures. Reference: Museum, H. P. M. "The Spirit of Hiroshima: An Introduction to the Atomic Bomb Tragedy, Hiroshima", The City of Hiroshima,1999.